When it comes to start the day, we are often looking for something quick and easy. While the ol’ cliche rings true, breakfast is the most important meal of the day, having a plan for this influential meal makes the morning (and quite frankly the day) run just a little bit smoother. Here are a few rules to getting breakfast right every time and breakfast ideas to get you started. Since breakfast is breaking the fast of the night, it is a vital way to start the day. Numerous studies have linked skipping breakfast to developing obesity, as it greatly impacts your metabolism. In fact, according to the National Weight Control Registry, a volunteer based study of successful long term weight loss, 78% of people who have lost weight and been able to keep it off eat breakfast every day. In adults and kids alike, eating breakfast is also linked to improved cognition, memory, and motor function. So really, wheather you eat breakfast or not is non-negotiable. Not only is eating breakfast uber important, the timing of when you eat also plays a role. Chrono nutrition is the study of your circadian rhythm and metabolism – how time and nutrition play a role in your organs that affect metabolism, your liver, pancreas, fatty tissue, and muscles. While these studies are new, it’s suggested that eating within one hour of waking is the ideal time to have your first bites of the day. As with all meals, having a balanced breakfast is critical if you want to obtain the benefits of eating breakfast. 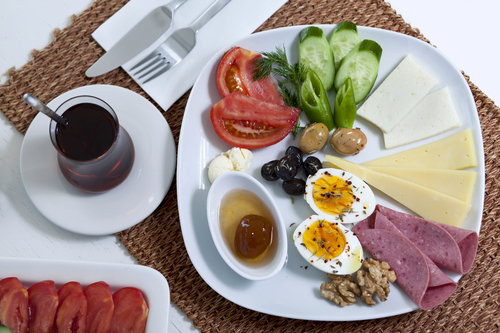 A balanced breakfast consists of appropriate amounts of protein, healthy fats, and carbohydrates, specifically fiber. While it may take a little planning at first, these can be planned to become second nature when you reach for something in the morning. Do you want to stop snacking in the evening? Eat a balanced breakfast. Want to stop cravings in the afternoon? Eat a balanced breakfast. Want to lose weight? Start with a balanced breakfast. Considering items as biscuits, cereal with milk, pancakes, and muffins, traditional breakfast fare is not exactly balanced and resembles desserts rather than a crucial meal to kickstart your day. This means that to build a balanced breakfast you may have to think outside of the box, allowing for some foods that are generally considered more appropriate for lunch or supper. Remember, a balanced breakfast has 3 components – protein, healthy fat, and fiber. The possibilities for breakfast are endless once you break free from the idea that breakfast must be traditional. The only limitation is your imagination. Do you have breakfast ideas you would like to share? Breakfast hasn’t always been my favorite meal but in the last two years it has become. I do feel better after I have a good breakfast. This morning I decided to have 4 eggs over easy with a half cup of plain yogurt with 3/4 cup of fresh pineapple and felt great after eating this. I think breakfast has always been my most important meal but it has not been very healthy. I now enjoy a small handful of blueberries (I love blueberries) three medium strawberries and about 6-10 almonds. I have to say that the most important part of my breakfast is my coffee, black with stevia. My morning coffee is so much more than just a cup of coffee. It’s that gentle nudg in the morning, a comfort that says “today is going to be great and everything is right with the world” before I enter the daily grind of reality. My morning coffee lies to me but it’s a good lie. Like Santa Clause or the Easter Bunny.